These five studies are ideal for anyone who is just starting their walk with Jesus. These five studies are ideal for anyone who is just starting their walk with Jesus. These are the introductory lessons you need so that you can power-on in your life as a Christian. These are the essentials that you must make sure you get right. The pages are fun and action packed - your students will love them! Study One: What's happened to me? Study Two: You're in the family! Study Three: Let's listen to God! Study Four: Let's talk to God! Tim Hawkins has been in full-time ministry for almost 20 years. He has as extensive ministry at both junior and senior high school levels. Tim is currently the Youth Pastor at St Paul's Anglican Church at Castle Hill, in Sydney, Australia. 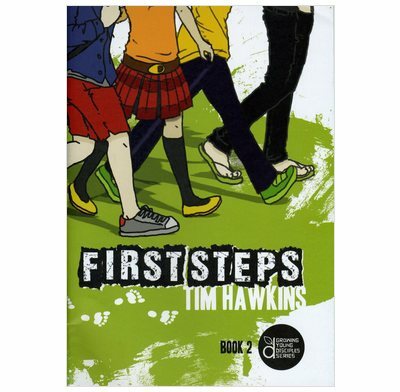 The focus of Tim's ministry is to equip teenagers to be faithful disciples. He has written the Growing Young Disciples series to train young people to take their place as active members of Jesus' team. This book is excellent - attractively presented, good for those who don't like reading books, very practical and good at going back to the basics and explaining what Christians believe and why they do what they do (e.g. pray, have fellowship). We have a group of young teenagers at a real mix of stages in their walk with Christ. We've found the whole of this series is really good for keeping them involved and active in finding out more about developing their relationship with Christ, getting to know the Bible and asking thought provoking questions.It takes them more from a 'head felt' relationship to a 'heart felt' one. This entire series is fabulous for discipling teenagers. It is simple, relevant, provokes conversation and clearly outlines the gospel message in a fun and relevant way. I have used it with a small discipleship group and have given as gifts to kids I know at church. I find it works equally well with those who have not yet come to know Jesus, new believers who have very little understanding of the basics of the Christian faith and kids from Christian backgrounds who need help defining what they believe. Each study is short enough to keep teens engaged. It has room for them to express their feelings and opinions. It helped me to quickly identify where each person has struggles or gaps in their faith. I would highly recommend. We used this material at our annual youth camp and found it to be an engaging and challenging programme for our youth group. The material encouraged discussion with issues our young people face.